Do you figure out how you’re going to get somewhere before you know where you’re going? Do you decide you want to drive, then decide on Thailand if you live in the States? Most likely not. 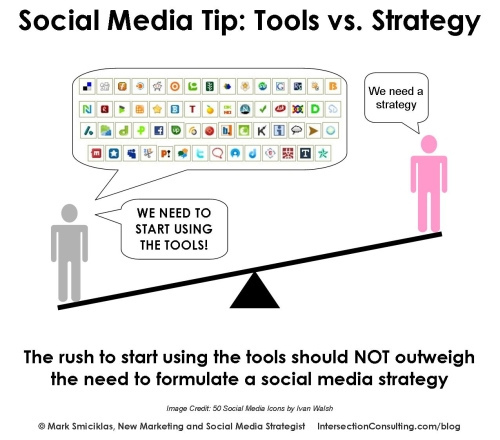 So why decide on what social media tools you want to use before you know the when, who, why, what, where, and how of what you’re doing? Why decide on a platform, such as Facebook or Twitter or Google+, before you know what you want to accomplish with these tools? The most important part is coming up with this strategy to figure out how to reach your audience. Otherwise you will just be haphazardly posting material with no goal in mind and no way to evaluate what you’re doing. However, I get it. It’s easy to do! When you have limited resources and you’re always working in a last-minute capacity to promote an event, campaign or fundraiser, it’s stressful. It’s much easier to throw up a one-off page but with no real strategy behind it, but in the long run, that can be more harmful than good. You don’t want to post too many fundraisers or ask your audience to participate in too many campaigns without providing any useful content, advice, or offering to answer questions. Otherwise, you will alienate your audience. You want to work on understanding what your goals are and what you want to give your audience. If you give to them, they will be more willing to support you. It’s hard to say without specifically analyzing your organization what strategy will work best for you, but there are some things that will remain constant and questions you should ask to form your strategy. There are no quick fixes. It’s not just about posting a few things a week on Twitter and not engaging with your audience. It’s about developing long-term relationships, building trust, and finding and bringing the right audience to you. So how do you develop that strategy? Where should you be in the social media world? And, what can you ignore? Here, and in the next four posts, I’m going to highlight the when, who, why, what, where, and how of putting together your social media strategy. Let’s start right now with when and who. So, WHEN Are You Going to Create This Strategy? The best time to start is right now. Even if that just means jotting down a few notes as you read this. It will be easier when you come back later. And don’t just skip to the how part of this series. It doesn’t work that way! Above all else, you need to tailor your strategy to your audience (supporters or customers). Who are you trying to reach? A new audience, or are you trying to develop more of a relationship with your existing audience? What do you know about your audience or the audience you would like to attract? What are their target demographics? Age, location, gender? You’ll also want to think about their psychological profile. What are their interests? What are they passionate about? What is their lifestyle like? If you are a nonprofit focusing on defending the environment, you might want to attract people who are passionate about nature or being in the outdoors. If you own a small painting business, you’ll want to attract homeowners, probably those in your local area. You might also want to consider generally what type of personality you would like to work with, especially if you are a one-person consulting business. It’s important to bring in clients that you would not only enjoy working with, but who you might be best able to communicate with. In his blog Communicate & Howe! James Howe notes that it’s likely you will have multiple audiences for your overall strategy. For specific campaigns, you can narrow it down further. But you might want to consider developing separate audience lists and prioritizing them when possible. He mentions that you can develop personas — a process that is followed to identify your website audience (for those of us who work on websites also, it can be quite fun, but also a lot of work). Don’t worry if you feel like you’re narrowing your list(s) down too much. You can’t possibly reach everyone online, and narrowing it down will allow you to understand who your audience is and determine how best to connect with them (instead of trying very broadly to reach everybody and reaching nobody). This, in turn, will bring them closer to your organization. It’s the start of how to build “super fans.” If this idea does not sit well with you, do it for now, see what happens; you can adapt it later! Stay tuned for part two, which will discuss why you should use social media, by helping you figure out your goals. What did I miss? If you’re out there reading, let me know I’m reaching you in the comments below. Thanks for including my post on audience of a nonprofit communications strategy in this post. You’re welcome! Thank you for your great blog posts!